Hey everyone, I thought a guide on this was very necessary to provide an even playing field for everyone on the server. This farming technique is used by pretty much every medium-large tribe and is necessary for everyone to use if they want to compete. What is it? 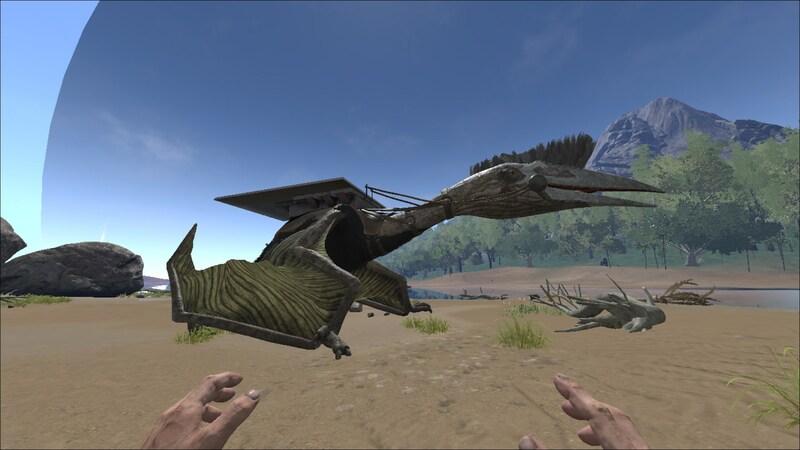 It's basically using a Quetzal with a platform saddle that has a ramp built on it to carry around an Ankylo, Mammoth, Doedicurus, etc, to farm materials infinitely. I will say beforehand that it is pushing the mechanics of the game to their limit and maybe be considered an exploit, however it is a legit farming method and not against the rules to use. It CAN be done solo, but it is far more effecient to use 2 players (1 to ride the Quetzal and 1 to ride the Ankylo/Mammoth/Doed). Here is how it's done, step by step. First you'll need a Quetzal and equip it with a Platform Saddle. Add 2 foundations to it. Thatch, wood, stone, metal and glass metal will all work. Attach 2 ceilings long to the foundation so that they extend to the side of the Quetzal. 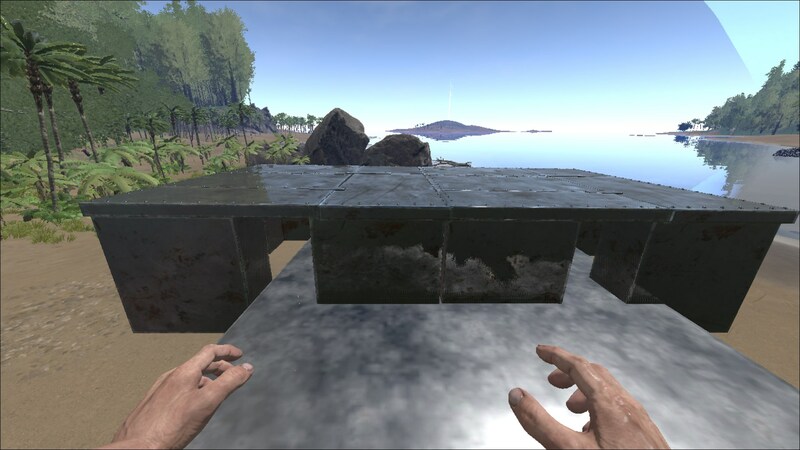 Attach 5 ramps to the ceilings as you see here. 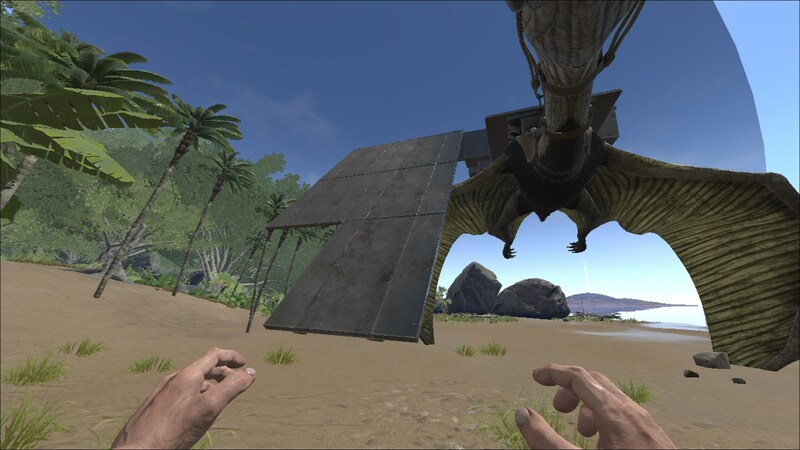 You may have to fly the Quetzal above the ground slightly to place the 5th one. Now that the ramp is complete, you need something to farm with. 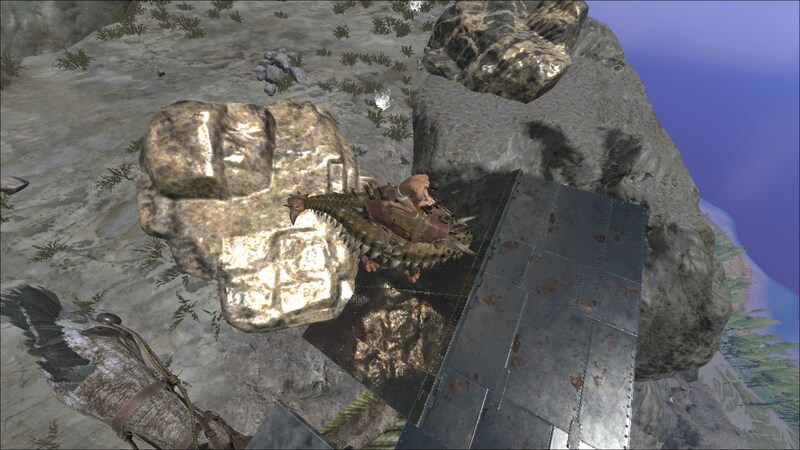 Ride the Ankylo up the ramp. 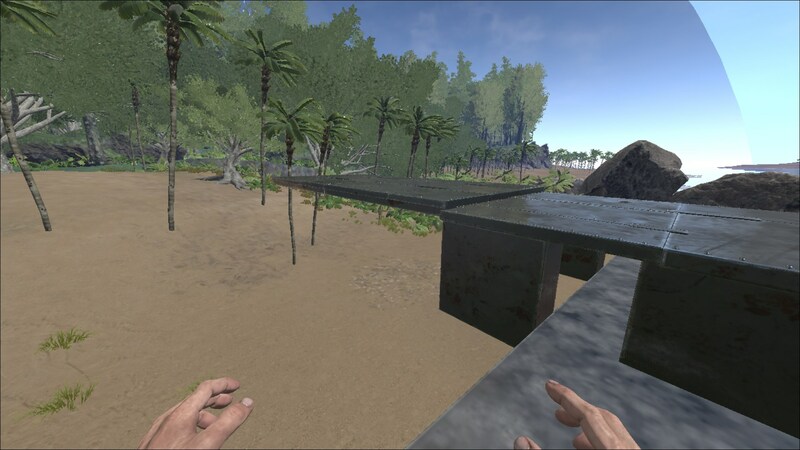 Fly the Quetzal toward a location that is abundant with the resource that you want to gather (in this case we're using an Ankylo so we're gathering metal). Fly the Quetzal so that when the Ankylo swings it's tail, it can hit the resource. 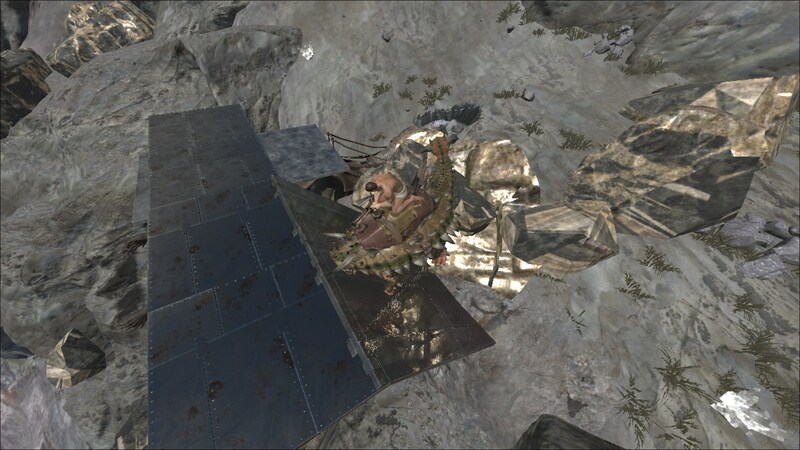 You can continue to fly around gathering resources more or less infinitely. If you're curious about why this works, it's because the Ankylo will continue to gather resources regardless of how much weight it has. Since the Quetzal is the one moving the Ankylo around, being encumbered is not an issue. 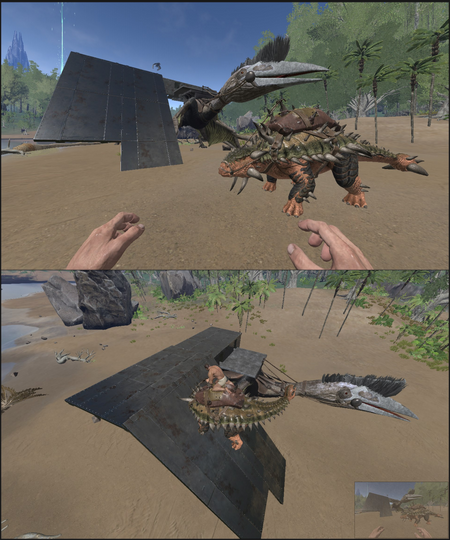 The weight, since the Ankylo is on the the ramp and not in it's talons, doesn't affect the Quetzal either. Also, if the Ankylo falls off, it's not that big a deal as long as it doesn't fall in deep water. You can get it back on the ramp by walking/flying up to the Ankylo and slowly moving the ramp into it, which will clip it back onto the ramp! 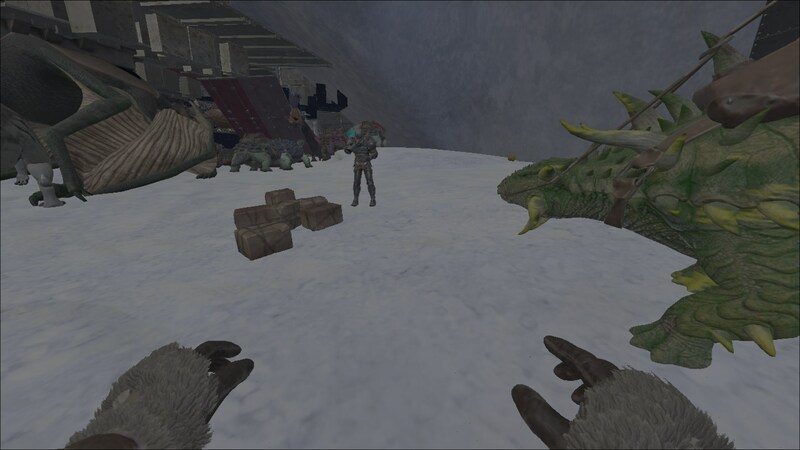 Have a tribemate stand in front of the Ankylo you used and drop all of the resources from the Ankylo's inventory (you can do this quickly by spamming the "O" key on the items in it's inventory). Have your tribemate pick up all of the resources. Since they were dropped items, there is no limit to how much he can hold. Knock him out drag him to the location that you want to unload the resources. You can drag anyone regardless of how encumbered they are. Once they have unloaded their resources, you're done! So this is how all of the biggest tribes mass resource farm! Hopefully everything made sense and will be useful to a few tribes. Thanks for reading! Awesome guide and thanks for writing this up Vance! I'm 100% in favor of transparency with tricks like this and graphics settings to level the playing field for everyone. (01-15-2016, 11:08 PM)DR Wrote: Awesome guide and thanks for writing this up Vance! I completely agree with DR on this. This gives everyone a fair advantage and playing field. Thank you for the post Vance! I cannot build this, since you can only build 2 ramps downwards on the ceiling pieces. How do you get the third down? It always tells me the ramp is not close enough to a foundation.